In order to meet Federal emissions standards, a magnesium oxide based scrubbing process is used to remove sulfur dioxide from the coal-fired plant's exhaust. 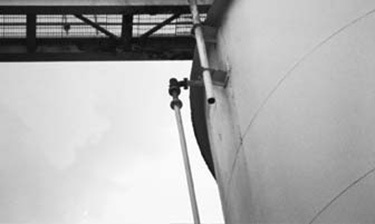 The MgO powder is pneumatically conveyed from storage silos to a mixer where it is mixed with water and then sprayed into the plant's exhaust stacks. It combines with sulfur and other pollutants, resulting in an MgSO3 slurry, which is then eventually processed to H2SO4 and MgO which can be recycled and used again. Whenever the generating plant is in operation, the MgO system must also be running in order to maintain sulfur dioxide emissions below mandated levels. At the Eddystone facility, standard type 316L stainless pipe elbows frequently wore out, creating a wide range of costly problems. The elbows were components of a three-inch line that relieves system pressure, venting the rotary airlock at the base of the silos, and returning excess product to the top of the silos, approximately 90 feet in the air. This vent/return line operates at 9 PSI, and the leaks were occurring at the backs of both the bottom and top elbows. When leaks occurred approximately every four to six months, a cloud of MgO dust was released both inside and outside the plant, which created internal and external plant clean-up expense, and involved EPA regulatory concerns. When leaks occurred in the elbows located at the tops of the silos, repairs were made by scaffolding down from the top of the silo to the worn elbow, replacing it, then removing the scaffolding. Engineer Gavin Heckler estimates that each repair cost approximately $4,000 in terms of labor alone. Due to safety concerns, OSHA wanted a fixed platform built at the top of the silos if frequent repairs were going to be required. Six 3-inch HammerLast HammerTek Smart Elbow models replaced the standard stainless elbows, providing the advantage of flange rather than weldment installation. According to Heckler, the standard stainless elbows lasted about four months if the MgO systems were operating at full capacity, 24 hours per day. Under similar conditions, "...the HammerTek elbows have been installed for one and one-half years and are still functioning fine. We've installed them in a second silo vent system." The Smart Elbow design relies on deflection, not impact, to change flow direction, thereby eliminating the impact-related problems associated with virtually every other conveying elbow design. At system start-up, a gently rotating ball of suspended material forms in the patented vortice vortex chamber of the Smart Elbow deflection elbow. As the main flow of material passes this ball, it is "deflected" through the desired change of direction without impact, friction or wear to the elbow's interior surfaces. HammerTek Smart Elbow products can save your company time, expense and reduce regulatory paperwork by not failing in the first place. Truly an intelligent "ounce-of-prevention" for conveying systems where any incidence incidents of sweep elbow failure has environmentally sensitive consequences. For industry specific information on tube or pipe size Smart Elbows, or details about the company's Free Trial Offer, contact HammerTek Corporation, 2400 Emrick Boulevard Bethlehem, PA 18020; 800/505-9665, 610/814-2273, fax: 610/814-0600, E-mail: elbows@hammertek.com. Please visit our website at www.hammertek.com. Well into its second decade of operation, HammerTek Corporation has established a solid reputation as an innovative U.S. manufacturer of "problem-solving" conveying elbows. The design and flow characteristics of the Smart Elbow are patented in the U.S. and 15 other countries.